The electro-pop jam gets a goth twist. In a brief performance at BBC Radio 1's Live Lounge on Tuesday, Pale Waves covered Dua Lipa and Calvin Harris's collaborative electro-bop "One Kiss." Waves singer Heather Baron-Gracie took the warm, summertime single and gave it a hazy, goth twist, singing the song in a somber, slower tone over a woozy synth's and a wispy guitar melody. 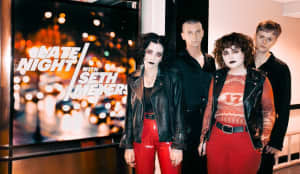 This month, Pale waves released their debut album My Mind Makes Noises after sharing a number of singles, including the Marilyn Manson-esque "One More Time" music video. Thumbnail image courtesy of Morgan Hill-Murphy for FADER.